The Reverend Rob Lee is a millennial and master of theological studies student at Duke University Divinity School. Rob has been featured in his hometown newspaper where he has a regular column, as well as The Huffington Post, Ministry Matters, and The Washington Post. He lives in Durham, North Carolina but calls the western part of North Carolina home. He and his fiancée Stephanie Sansoucy have two poodles, Lizzie and Frank. 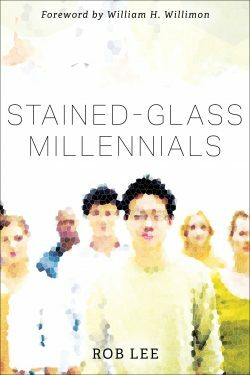 First, what is a stained-glass millennial? A stained-glass millennial is someone who has decided to invest their life in some way within the institutional church. We hear so many stories of institutional decline and financial woes within the church, and it’s important to listen to those tales, but those tales also aren’t the fullness of who God is and what God is doing within the life of the institutional church. Eugene Peterson said that every preacher preaches one sermon, that preachers drive home one message consistently throughout their ministry. If this book is any indication of what my one sermon is, it’s that God is not done with us yet. God has not brought us this far to leave us here alone, and stained-glass millennials are a testament to that.